What does LE mean on an LG Dishwasher? There may be a few different reasons why the LE error code can display on your dishwasher. LG dishwasher getting the LE error code? The LE error code on the LG dishwasher display is an indication of a MOTOR ERROR. The 5 issues that may cause this fault code is a wiring problem (most common reason for LE error), the impeller of washing pump is locked, the rotor of washing motor is locked, the blade is locked, or the PCB main control board is faulty. All these issues can cause your LG dishwasher to display the error code LE. With all these different issues, checking, repairing or replacing the components that can cause this error code will clear the error message and fix your LG Dishwasher. 1 – Push the POWER button and turn the LG dishwasher OFF. 2 – Flip the breaker to the LG dishwasher to OFF and wait 30 seconds. 3 – Flip the breaker to the LG dishwasher back to ON after 30 seconds. 4 – Push the POWER button on the LG dishwasher to turn it back ON. 5 – Begin a new wash cycle and see if the LE error displays. If the LE error code is NOT displaying, the dishwasher is fixed, resume normal washing. If the LE error code is STILL DISPLAYING on the panel, see below for what you must check or repair to clear the LE error code. 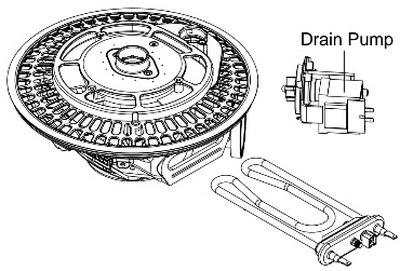 The LE error or fault code on your LG Dishwasher indicates an issue with the water circulation pump motor. -Turn off the LG Dishwasher for 30 to 45 minutes to let the motor cool down as it may have overheated. -After 30 to 45 minutes start a new wash cycle and check if the LE error code shows again. -Check to be sure the wiring harness/wiring to the pump motor is securely connected and not damaged. -Check that the wash impeller and rotor is not broken or frozen as this will cause the LE error code to appear. -If the impeller, rotor, and the wiring harness check to be good and no issues are found and the LE code reappears, the next step is to replace the dishwasher pump and motor assembly. 1 – Check the Wiring Connections and or Wire Harness to and from the motor. 2 – Check the motor impeller, motor rotor, blade to be sure they move freely and are working properly. 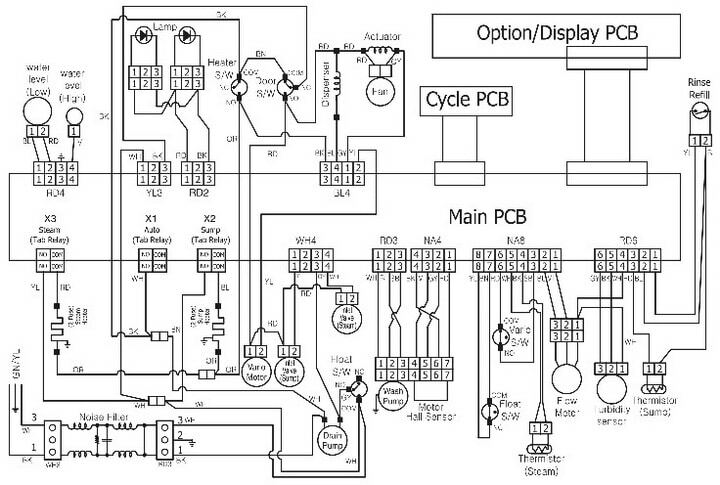 3 – If the wiring, motor, rotor, impeller, blade all are found to be in working order (all mechanical parts and all wiring is found to be in working order) the final part to replace is the PCB Main Control Board (Faulty Main Board). 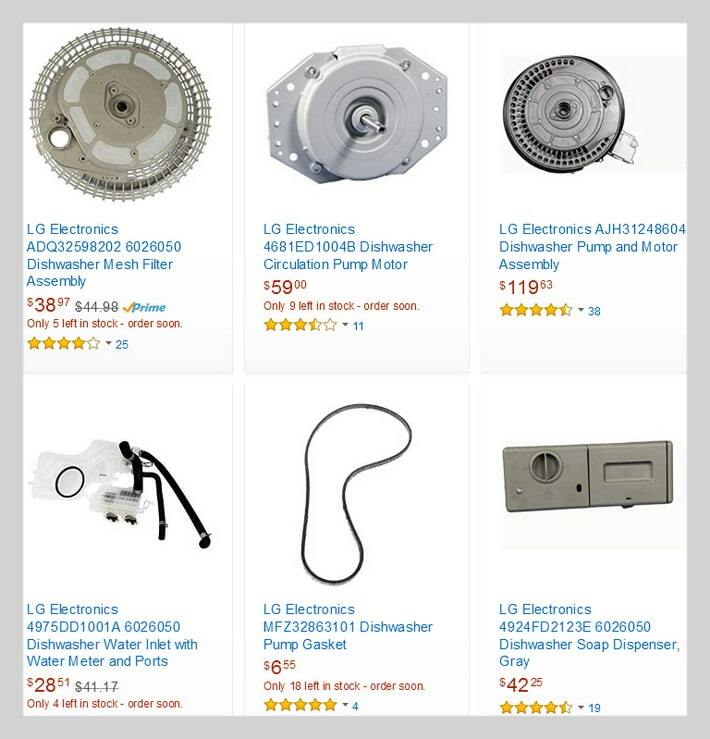 NOTE: To check the motor and use the troubleshooting methods above, depending on the model of LG dishwasher and how it is configured, you may have to remove the dishwasher from the cabinet and turn it upside down to troubleshoot the motor and check the components and parts listed above. 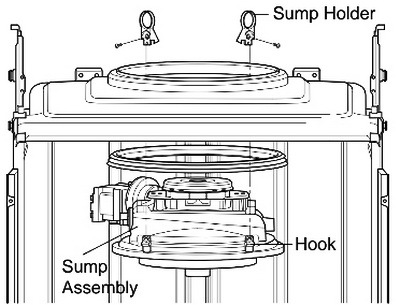 Also another bit of information good to know is the drain pump is a separate pump motor from the main wash motor. Some wires that may cause the LE error code can be accessed by taking off the door panel and check for broken wires. ANOTHER ISSUE THAT CAN CAUSE THE LE ERROR CODE ON YOUR LG DISHWASHER: BROKEN OR DAMAGED WIRE IN THE DISHWASHER DOOR? If the LE error code is showing because of a broken wire in the door, you can check and fix the wire by removing all the screws along the inside perimeter of the dishwasher door. The front door will completely come off. There will be adhesive holding the insulation inside that can be simply pulled off. There will be wires at the bottom of the door. These wires are fixed into a plastic guide. Check all these wires in this area. There may be a broken grey wire or a blue wire. These wires are in a thick coated material in the inner door. Check all wires to be sure they are not broken, crimped, or damaged in any way. If you find a bad wire, you can repair it and this should clear and fix the LE error code on your LG Dishwasher. 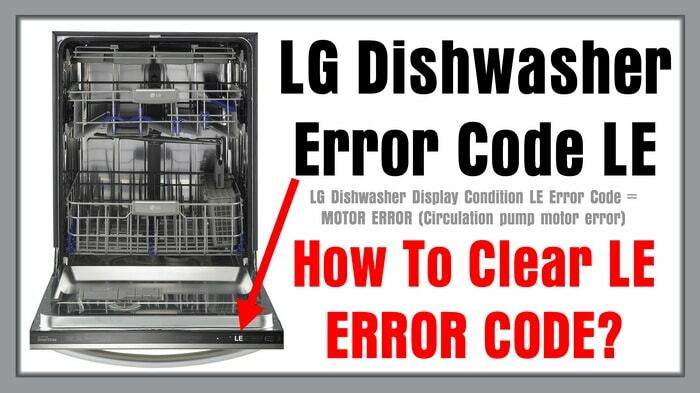 Have questions about how to fix or clear the LE error code on your LG Dishwasher? Leave your question below and we will be happy to assist you with fixing your LG dishwasher. The breaker is on your home, in the breaker box (fuse box). Check on the outside of your home. Make sure to flip the correct breaker.